"A traditional Lebanese dish of baked chicken and potatoes, which I learned from my mum. Unbelievably simple, but ever so delicious." 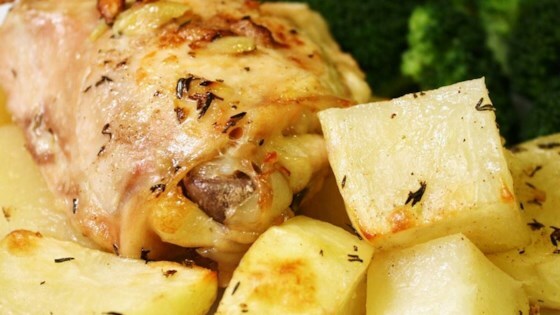 Place chicken and potatoes in a large baking dish. Season generously with salt and white pepper. In a bowl, stir together garlic, olive oil, and lemon juice. Pour over chicken and potatoes. Cover dish with foil. Bake in preheated oven for 30 minutes. Remove foil, increase heat to 475 degrees F (245 degrees C), and cook until chicken and potatoes are golden, about 30 minutes. A comfort food classic with simple, delicious ingredients. Remember to use yellow potatoes, other varieties do not work as well. Delicious! I added a bit of cumin and thyme, and doubled the garlic. It was great with steamed green beans - we'll be having this again.